After passing several certification bodies such as TENAA, WFA, and US FCC, Samsung's the render upcoming high-end flip smartphone just leaked online. It showed what could the front, back and sides of the device would look like. A flagship grade flip phone, why not? The flipping smartphone has a device number SM-G9298 or the possible W2018. It is powered by by Snapdragon 821AB quad core chipset, 4 GB RAM, 64 GB storage and 2,300 mAh of battery. 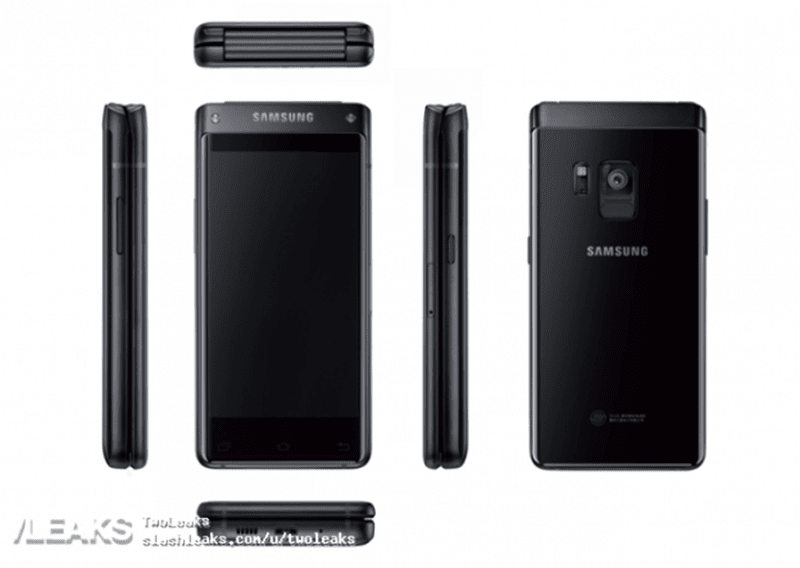 It could also carry Samsung's 12 MP rear camera and 5 MP front facing camera. It runs with Android 6.0 Marshmallow operating system. There are also rumors that this handset might come with a Snapdragon 835 SoC and 6 GB of RAM instead of Snapdragon 821AB and 4 GB of RAM. The phone is going to support Samsung Pay, S Voice and wireless charging. It is expected to launch sometime this coming August in China.